If you cringe every time you walk into your garage, you know that you could do so much better. It is actually not difficult to get garage storage systems that work for your possessions and the way you intend to use the garage. Consider garage shelving, garage cabinets, wall systems and overhead garage storage to turn your entire garage into the organization paradise you deserve. 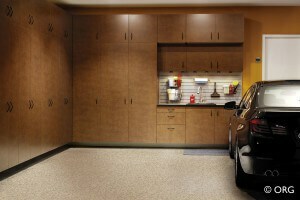 Before long, you will be shocked by how nice it is to have a clear garage floor for other activities. You don’t need to spend all your time thinking about how to organize your garage walls. The ceiling is also a great place to store certain items. Overhead garage storage is your solution to many storage problems. Custom garage storage systems make it easy for you to access overhead storage to grab bins or bags and put them away as needed. Designate the ceiling to store the items you do not need as frequently, such as seasonal outdoor gear, patio cushions and accessories and holiday decorations. Storing these items on your garage ceiling will also protect them from damage while you are not using them. Not every item is best placed in garage cabinets or shelving. This is where slatwall storage comes in handy. Slatwall is a panel garage storage system with slats at a specific interval. Once the panels have been placed on the wall, you can slide accessories like hooks or shelves into the slats. Slatwall is very sturdy and can hold ladders, bikes and other heavy items you would rather not store on the floor. With a wall system, you will have a spot for your tools, yard equipment and materials for your hobbies. Garage organization is such a worthy endeavor. All you have to do is decide what you want to store in the garage and then hire a professional to design garage storage systems that maximize your garage space and make your life easier.